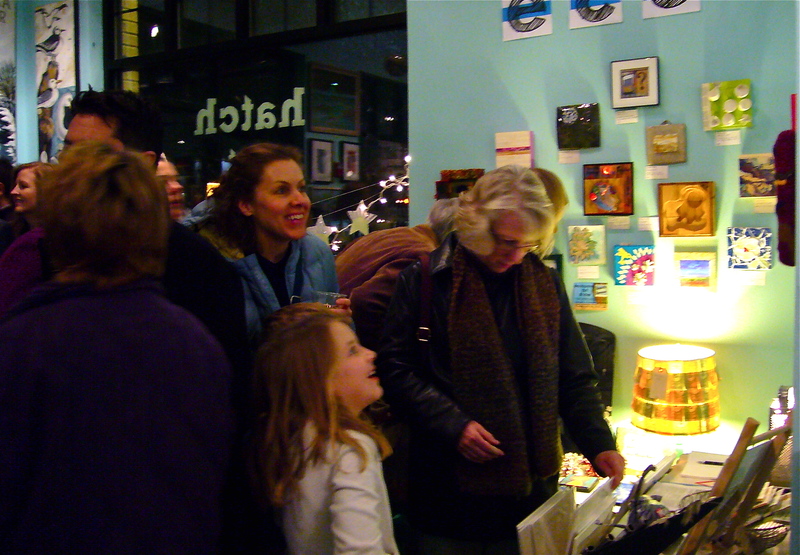 We are already into our final few weeks of the EcoSquared Art Show here at Hatch… Our opening reception January 11th was a roaring success with a gallery full of creative and energetic people! Lindsay Christians gave the show quite a boost with her wonderful article in the Arts section of the 77 Square newspaper. Next up is the closing reception this Friday, February 8th from 6-9pm. Stop on by to see what it’s all about! Remember that all art pieces are available for purchase but we do appreciate pick-up near the end of the show. The artists will be available to talk with and we’ll have refreshments on hand. Please join us! Click here for the Facebook Event Page, click on join…then feel free to invite your friends. 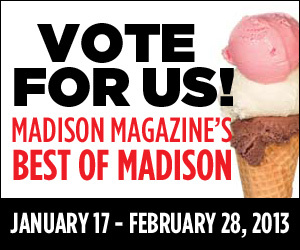 Another “happening” this month is the Madison Magazine “Best of 2013” ballots are out. Hatch has been nominated for the best “Art Gallery” category. But we ALSO think we would work well under the “Gift Shop/Specialty Store” category! Write us in next to ‘other’ for that one. Hatch and it’s artists would really appreciate your vote! We’ve worked really hard these past 2 years;) VOTE HERE …The results are announced in the July issue. 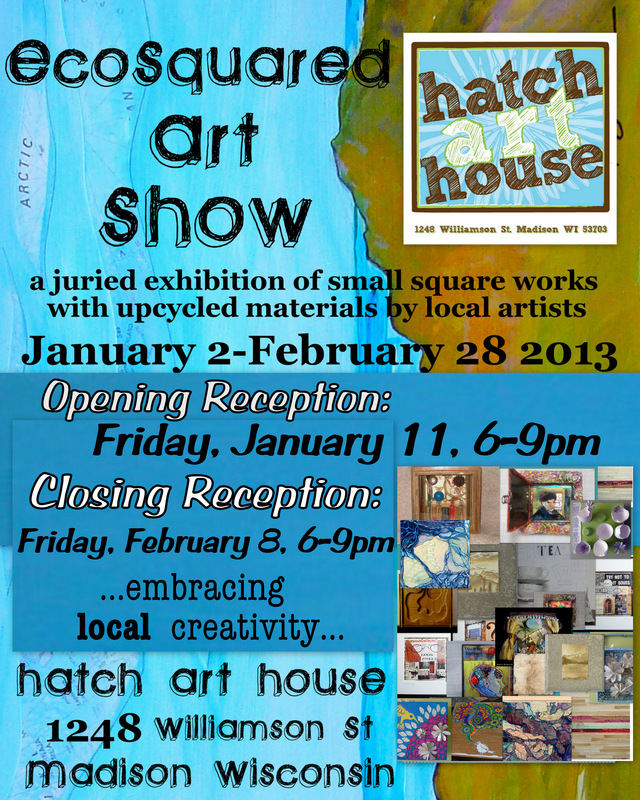 January 2013 Happenings…including the EcoSquared Art Show! 2012 was kind of a big year for Hatch. I learned a ton and we grew a lot! We now have 43 artists, up from the 20 we started with back in December of 2010. Twice as many artists means twice as much work…so thank you for being patient with me while I figure out how to achieve a nice balance (and maybe get a bit more help!). I am THRILLED with the way Hatch is growing! So many people are embracing the ‘shop local’ culture and are happy to have us here on Willy Street. That being said; I THANK YOU from the bottom of my heart for supporting Hatch and every artist in the shop! To kick off the year 2013 we are embarking into the world of themed art shows! For the months of January and February you can stop in and see our small works show; EcoSquared. Artists were given the opportunity to create work between 6″ square to 8″ square while incorporating upcycled materials. All priced between $50-$100. The results are fun, creative and very inspiring! All are available for purchase but we do appreciate pick-up near the end of the show. We’ll be having our opening reception for EcoSquared, Friday, January 11th from 6-9pm. The artists will be available to talk with and we’ll have refreshments on hand. Please join us! Click here for Facebook Event page.